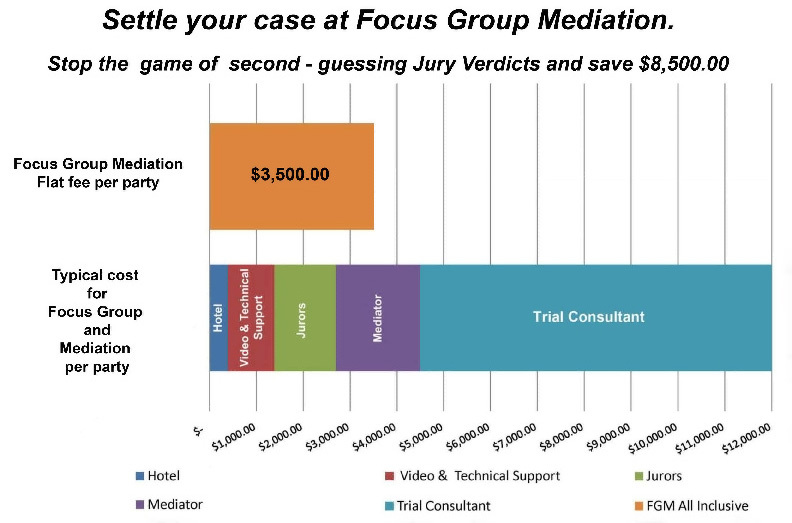 Focus Group Mediation delivers an integrated multifunctional ADR service to the legal community bringing people, place, trial consultant, mediator, and parties together at the same time. This real time consensual reality check from disinterested 3rd parties is added to the information exchanged in the traditional caucus-based mediation process thus bringing in otherwise unavailable pieces of critical information to the case evaluation and resolution process. Parties in each others presence make a presentation to the entire Focus Group Panel of a summary of their case. A one hour time limit is imposed per side. The mediator then proceeds to conduct a traditional caucus-based mediation utilizing the findings and discussions of the Focus Group Panel that play a key role in re-evaluating the strengths and weaknesses of the parties positions thus increasing the likelihood of case resolution. This process, while effective, is NOT for everyone. Both sides need to be prepared to hear direct and candid feedback from Focus Group Panel members, the trial consultant, and mediator. This feedback can and usually will be surprising and unsettling. BETTER NOW IN A DRESS REHERSAL THAN AT THE END OF TRIAL. Copyright © 2010-2020 by Legal Consulting Services, Inc. All rights reserved.